The fourth book in the Science of Discworld series, and this time around dealing with THE REALLY BIG QUESTIONS, Terry Pratchett's brilliant new Discworld story Judgement Day is annotated with very big footnotes (the interleaving chapters) by mathematician Ian Stewart and biologist Jack Cohen, to bring you a mind-mangling combination of fiction, cutting-edge science and philosophy. The Wizards of Unseen University feel responsible for Roundworld (as one would for a pet gerbil). After all, they brought it into existence by bungling an experiment in Quantum ThaumoDynamics. But legal action is being brought against them by Omnians, who say that the Wizards' god-like actions make a mockery of their noble religion. 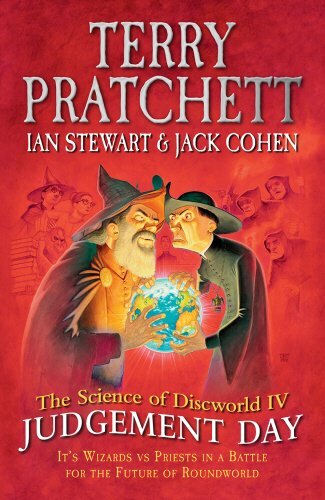 As the finest legal brains in Discworld (a zombie and a priest) gird their loins to do battle - and when the Great Big Thing in the High Energy Magic Laboratory is switched on - Marjorie Daw finds herself thrown across the multiverse and right in the middle of the whole explosive affair. As God, the Universe and, frankly, Everything Else is investigated by the trio, you can expect world-bearing elephants, quantum gravity in the Escher-verse, evolutionary design, eternal inflation, dark matter, disbelief systems - and an in-depth study of how to invent a better mousetrap.